Fight your way to Dr. Teklov to save the world. 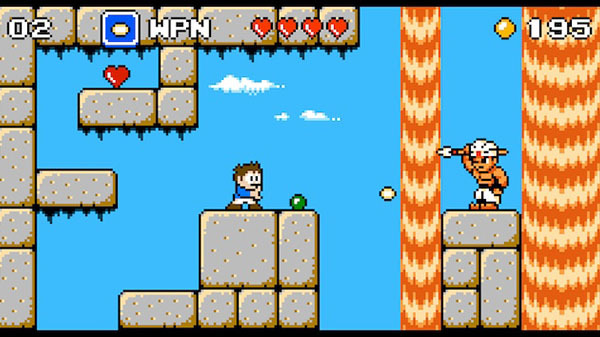 Retro action platformer Venture Kid is coming to Switch as a console-exclusive, publisher FDG Entertainment announced. First released for smartphones in 2016, a PC (Steam) version is also planned. Back in the golden age of cartridge games, the development team fell in love with those highly creative games made by small teams who seemed to do wizardry with the limited hardware at that time. Many video game heroes were born back then and we’d like to rekindle one of the best series ever made. Check out the video to find out more, can you guess which one it is ? The evil Dr. Teklov is about to build a secret weapon, disguised in his huge space fortress. Time is running out but our hero Andy stepped up to defeat him and fight his way through Teklovs minions. Join Andy and prepare yourself for a dangerous journey that demands great skill and determination. Will you succeed? Nine action packed levels and bosses. Chiptune soundtrack by Matt Creamer (Retro City Rampage). Eight unique and useful Power-Ups to help you on your quest.